Depending on whose account you read, Zelda was either F. Scott Fitzgerald’s muse or the thing that ruined his life and his writing career. What often gets lost in the discussion is the fact that Zelda was a smart woman and a talented writer in her own right. Therese Anne Fowler’s Z remedies all of this. Z joins Zelda’s story before she ever meets Scott and covers her life through their often rocky marriage through Zelda’s institutionalization and Scott’s death. I loved this book from page one. Fowler’s writing is lovely, and seems to bring the essence of Zelda roaring to life. My favorite thing about it, though, may have been Zelda’s antipathy towards Hemingway. I do not personally have a high opinion of the man (or his writing, to be honest), so Zelda’s smack talk made me feel vindicated in my opinions of him. Fowler’s Hemingway is delightfully mean and vindictive, with a side of manipulative that ensnares her Scott Fitzgerald. Of course, a novel cannot be carried on hatred of Hemingway alone. 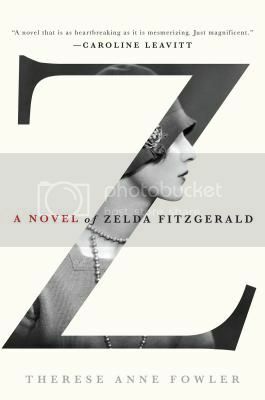 Luckily even for those of you who adore Hemingway, Z is a vividly imagined novel about one of the most fascinating women of the early 20th century. Very highly recommended. I’m so looking forward to this book! I just downloaded an ARC of Erika Robuck’s new book on Zelda Fitzgerald and think it’ll be so interesting to read the two books in tandem. Zelda IS a fascinating literary figure and I’m glad to see you liked it so much. I’m very much looking forward to reading this book…one of these days 😉 Reading about literary figures is the most fun! I have this one on my TBR. I am hoping my library get it soon. Yeah I’m never too sure what to think about the growing trend these days toward making novels out of people in history, like Hemingway’s wife and Lindbergh’s wife, and Fitzgerald’s wife etc. Sometimes I think I’d like to read their biographies first. hmm. It isn’t really a new trend, that’s what historical fiction has been for quite some time. Heck, all the way back to Shakespeare and his plays of English kings (and probably before, but that is the earliest example I can think of off the top of my head). The only new thing is that we are getting more and more people from the 20th century, but much of Zelda’s story is 90 or so years old, so that can’t be too surprising at this point. I loved, loved, loved this book (my review was actually titled Languish With This Book. I really liked that Fowler didn’t really pick a side. She showed things from Z’s perspective, but without vilifying F. Scott. I’ve got this one on my TBR pile and your review just bumped it up to the top of the stack! I’ve been seeing this one everywhere! Another must-read to add to my toppling list.